tunGal. An intercultural music project based on duo improvisations by Chao-Ming Tung and Bernhard Gal. 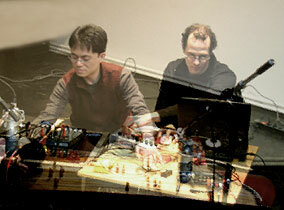 A first encounter in Vienna in 2002 was the starting point of a musical dialogue between Austrian composer / sound artist Bernhard Gál and German-based Taiwanese composer Tung Chao-Ming. Coming from quite different backgrounds (contemporary composition, traditional Chinese music, sound art, etc. ), in their duo project tunGal they attempt to combine their musical interests in an improvisational context. While Chao-Ming Tung plays the traditional Chinese instrument Guzheng (partly modified using the audio software MAX/MSP), Bernhard Gál uses a laptop computer and an amplified mozarella cutter. Since 2002, tunGal has been presented in concerts in Austria, Germany and the USA, including a featured event at the Night of Museums at the Museum of Eastasian Art in Cologne in November 2003. 2004 appearances include concerts in Vienna, Los Angeles, San Diego and Chicago.